Beneficiaries: 5,407 disabled persons ages 18 and over who are residents of Union County. All 5,407 (100%) are considered low and moderate income. 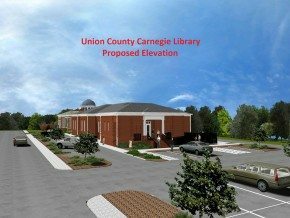 Project Description: There are plans to renovate the Union County Carnegie Library, to include renovations on the lower and ground levels to allow space for expanding programs. The CDBG project will consist of the construction of items to make the library accessible to disabled persons. Construction activities will include accessible parking; an accessible entrance; accessible bathrooms; accessible doorways, where needed; a fire alarm system with audible and visual warnings; accessible stations for computers and an elevator to the lower level, where public group sessions, meetings and other services will be provided. Beneficiaries: Citywide benefit- 8,100 residents, (52.53%) of whom are low and moderate income. Project Description: The project activities include new sidewalks around the City block from Main Street along the eastern side of N. Pinckney, along the southern side of E. Academy and returning to Main Street along the western side of N. Gadberry; landscaping with irrigation; reclamation and resurfacing of city owned public parking within this area; the installation of 10 historic street lights; and ADA accessible sidewalk ramps. The Town of Great Falls was awarded a SC Rural Infrastructure Authority Basic Infrastructure Grant for the Seaboard Sewer Trunk Line Upgrade Project in May 2015. The project entails the replacement of a portion of a seventy-year-old main sewer trunk line. The total project cost is $392,800, with a grant amount of $346,800. Bids are due in January 2015 and construction should begin in February 2015.